What we think of as the event of divorce is actually not one event but three distinct processes. Each of them continues over a period of time, usually several months. They overlap and interact with each other in ways most of us cannot anticipate. For convenience, I talk of all three divorces in relation to the date when you separate, the “S Date.” Although many divorces involve many “S Dates,” I’m speaking here of the one that really marks the end of the conjugal relationship. It’s usually, but not always, the last separation. This drawing represents the three divorces as occurring in time in relation to the S Date. 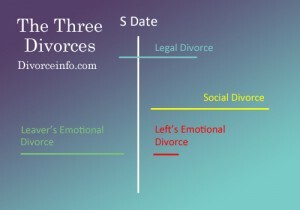 For example, the Leaver’s Emotional Divorce typically begins and ends before the S Date, while both the Social Divorce and the Left’s Emotional Divorce begin and end after the S Date. The legal divorce is the part where lawyers and judges get involved. This is where you and your spouse argue, fight, posture, and negotiate to work out your parenting plan, how you’re going to divvy up your property and debts, and who’s going to pay what support to whom. The legal divorce typically begins before the S Date and ends anywhere from a few months later to a couple of years later. This legal divorce is the one most people think of first when they conjure up their image of divorce. It’s also where most of us spend the most money in divorce. In reality, though, the legal divorce is the easy part. The good news about the social divorce is that, at least technically, it’s not your job. The social divorce is the adjustment your friends and family (including your children) must make to the fact that you and your spouse are no longer a couple. Some of your friends and family will handle the social divorce with dignity and acceptance. Others may cling madly to any hope they can find that the two of you will reunite. Remember, though: the social divorce is not your job. You’ve got enough to worry about. Let your friends and family accept your divorce on their own schedule. Typically, the social divorce doesn’t really get underway until after the S Date, and it may drag on for years. Why does the social divorce drag on so long? Two reasons. The first is that you may have friends and family (most particularly your children) who cling for years to the hope that your divorce isn’t really happening. The second reason is that you probably have many friends, relatives, and acquaintances whom you seldom see. They may not know for years that your divorce has happened. That means you’ll have people coming up to you for years and asking you how your spouse is. Please try your best to be understanding of them. Tell them gently and with as much neutrality as you can muster that the two of you are divorced (or separated). They will appreciate your candor, even if they’re embarrassed at the moment. This is by far the toughest of the three divorces. But you already knew that, didn’t you? This is the process in which each of you has to come to grips with your separation and begin to view yourself as a person separate and distinct from your spouse. This is where divorce gets messy. Painful. This is all about the grieving both of you have to do. The tricky part about the emotional divorce is that, unlike the legal divorce and the social divorce, you and your spouse deal with your emotional divorce on radically different schedules. Most divorces involve a “leaver” – that’s the person who wants to split up – and a “left” – that’s the person who wants the marriage to stay intact. Typically, the Leaver’s Emotional Divorce has been under way for months, often years. If you’re the leaver, you’ve already grieved over the marriage, and you know it needs to end. Your emotional divorce is more or less complete by the S Date. This means that you’ve probably given up on your marriage by the time you and your spouse separate. Incidentally, this is why I believe most trial separations eventually result in divorce. If you’re the leaver, you’re typically impatient with delays, and you want decisions from your spouse right away, and you tend to get put out with your spouse for what seems like unnecessary foot-dragging. The Left’s Emotional Divorce, on the other hand, typically doesn’t begin in earnest until well after the S Date, because even at separation, the left often assumes there will be a reconciliation and that the marriage will continue more or less as before. And once the left begins his or her emotional divorce, the impatience of the leaver tends to compress it. Can you see what happens? In many divorces, the emotional divorce of the left gets “squished.” It starts late, and then it hurtles along at a pace that seems out of control – that often is out of control. It’s during the emotional divorce of the left that spouses often behave in bizarre ways. This is the stage at which people sometimes shadow their spouses, and sometimes make anonymous and menacing phone calls. It’s at this stage that we see a husband go after his wife’s car with a baseball bat. It’s at this stage that husbands and wives both look for the meanest lawyer they can find. They want it to hurt, and they lash out any way they can. During this stage, emotions are white-hot. Logic simply has no meaning to the left during the peak of the emotional divorce. And because the left behaves in such a bizarre way, or perhaps in anticipation that the left will behave in a bizarre way, the leaver typically behaves in bizarre ways as well. It’s not a good combination. I spend a great deal of time with my clients explaining the three divorces. The key is to understand that when your spouse behaves in an irresponsible or irrational way, it doesn’t necessarily mean that he or she is evil. They’re just caught up in an incredibly cruddy process. You are too. You’re probably doing some irresponsible and irrational things yourself. Take me back to Why is My Spouse Behaving this Way?